WASHINGTON (CNS) — Days before Pope Francis’ visit to the World Council of Churches in Geneva, a top German Lutheran bishop praised the Catholic leader for his dedication to ecumenism. In an email interview with Catholic News Service, Bishop Gerhard Ulrich, leading bishop of the United Evangelical Lutheran Church of Germany, discussed the current state of Catholic-Protestant relations in Germany, the interfaith-marriage Communion controversy and his recent visit with Pope Francis. “Never before were the Reformation and its consequences, from the global level to local communities, commemorated in sisterly cooperation by our churches,” he said. The bishop said cooperation between the Vatican and the Lutheran World Federation on diaconal initiatives has increased as a result of the service. 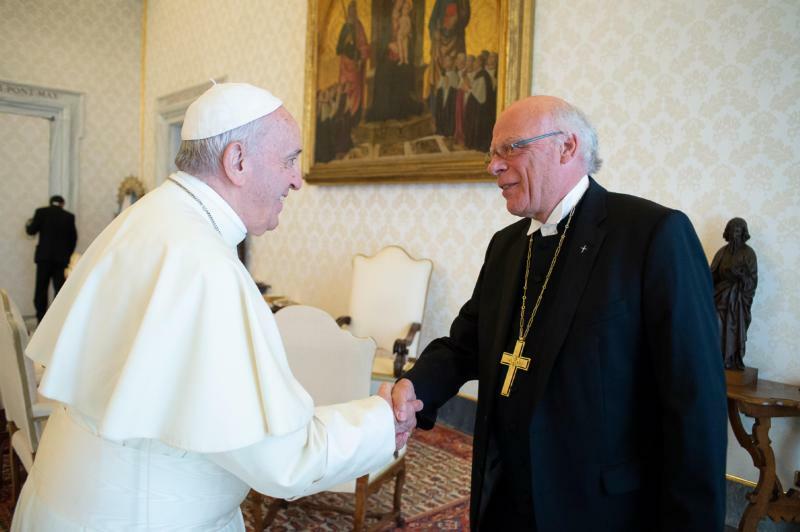 Bishop Ulrich, who met Pope Francis at the Vatican June 4 as part of the German National Committee of the Lutheran World Federation, said discussions focused on Lutheran-Catholic relations on a global scale and also their effect on the Lutheran Church in Germany. The delegation discussed topics that still remain controversial, including ministry, the Eucharist, and the church. During the talks, Pope Francis said advances must be made “together with patience,” which Bishop Ulrich viewed as self-evident for continuing theological dialogue and as special words of encouragement. Bishop Ulrich said Communion for interfaith couples remains relevant for believers and should be addressed, despite remaining the differences between Protestant and Catholic denominations. He said the issue, raised during the commemoration ceremony in Lund, tends to be addressed in individual cases and is not regulated by canon law. He said he believed a uniform approach would be helpful in addressing couples’ needs. He expressed confidence in Pope Francis and said he hoped talks on the issue of Communion for interfaith couples would continue. “These days, the visit of Pope Francis with the German Lutheran community in Rome in fall 2015 constantly returns to my mind,” said Bishop Ulrich.